In the document view mode (if that’s what it’s properly called) the metadata and tags and such are in a sidebar at the left, the document itself is in the main window, and the notes are below the document. Since most monitors are wider than they are tall, I would prefer to move the note-taking window to a sidebar to the right of the document. This would make for a three-part layout: a left sidebar with metadata/tags, a large center window with the document, and a right sidebar for note taking. Is this currently possible? If not, I’d like to offer it as a feature request. thank you for your feature request. 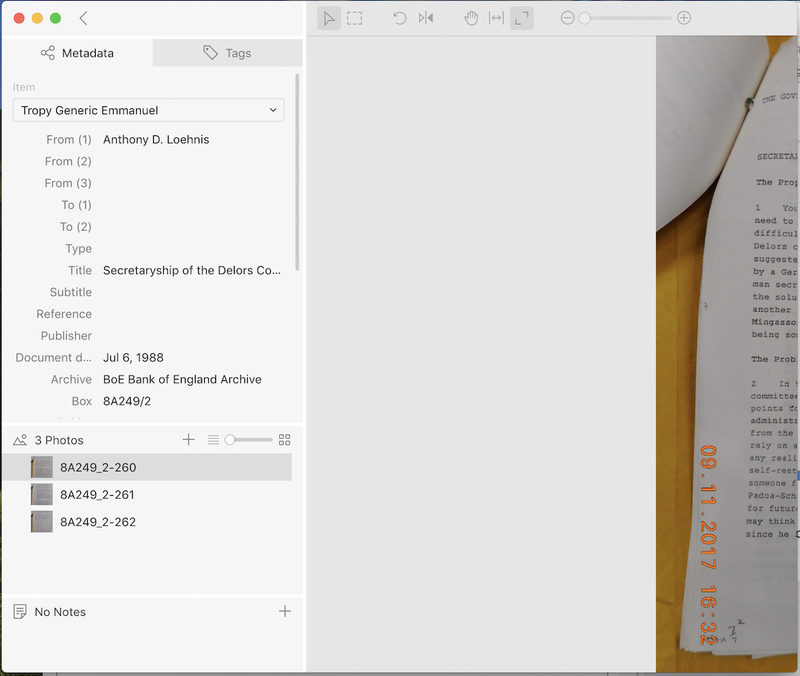 The current layout of the item view is a middle ground to make Tropy work on all monitor sizes, it also facilitates transcribing of documents. That said, we have been planning to implement flexible layout modes (including the three column layout you mentioned) in the item view all along and we are going to implement this soon – stay tuned! This is great news. I agree that the current layout, with notes on the bottom, makes sense for transcription in certain, even many, cases. But I know I’d also make extensive use of a three-column layout, which would allow me to see an entire image at a reasonable size without any panning or scrolling. I am sure I’d toggle between the two regularly. Just to let you know that Tropy 1.4, released today, includes a new preference to move the note pad to the right (called side-by-side layout). To switch between the layouts quickly you can also use the context menu on the image viewer or note pad. Love it – looks and works just like I hoped it would! Yes, this is a bug we unfortunately missed to mark as a blocker for 1.4.2. For that reason we’ll push another release (probably later today) with a fix. Sorry about the disruption! If you do that, side-by-side view should be working again until you restart Tropy (you might have to switch between stacked and side-by-side once more to trigger the change).